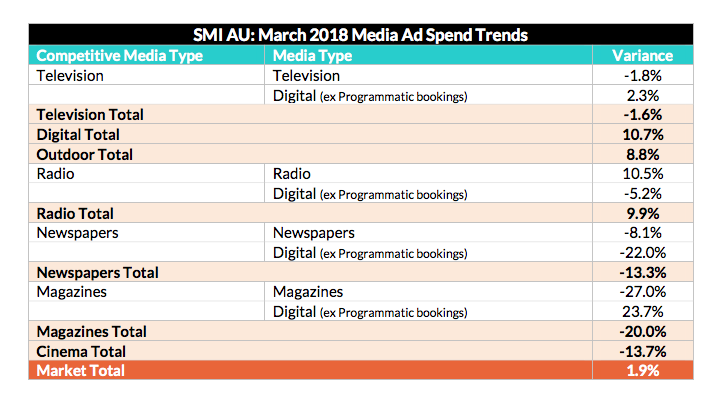 Australia’s media agency market has continued to ride a strong growth wave in March, delivering a 1.9 per cent increase in monthly ad spend to $632.7 million which in turn ensured record March quarter and financial year ad spend figures, according to the latest SMI data. Within that, each of the digital, radio and outdoor all delivered record levels of March ad spend while the newspaper media (ex Digital) reported its best result in two years with regional press growing 6.6 per cent and the National mastheads lifting Agency bookings 5.9 per cent. And within the digital media, the most notable feature was the ongoing surge in ad spend to social media sites (now up 25.3 per cent YOY), proving the controversy surrounding privacy issues has yet to have any impact on the industry’s local ad spend. 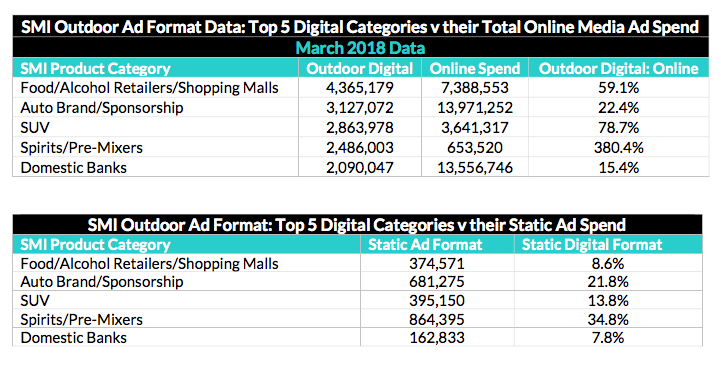 Meantime, this data release is also significant due to the launch of the world’s first outdoor ad format detail which provides the first view of ad spend shown by Static and Digital Ad Formats. SMI AU/NZ managing director Jane Ractliffe said SMI now reports digital and static ad format spend for all outdoor sectors (ie posters, street furniture, retail outdoor) and 126 product categories. “It’s another example of a great collaboration with our agency partners as we can now track the outdoor sectors benefitting the most from the industry’s digital transformation and also see which product categories are driving that growth,’’ Ractliffe said. But as for broader category ad spending in March, the SMI data shows that apart from the ongoing growth in government ad spend (up 56% YOY at least in part due to the South Australian election), this month there’s also been further growth from retail advertisers with that category the next fastest growing in dollar terms ( up $6.1 million YOY). And as the Financial Services Royal Commission continues to make its mark, we’re also seeing the domestic banks and other financial services categories deliver the third and fourth highest growth in ad spend by dollar value this month (up $5.7 million and $5.3 million respectively). And the market is even stronger over the quarter, with total agency ad spend up 4.2 per cent to $1.65 billion and with all the radio, digital and outdoor media reporting record ad spend. Australia’s agency market is also reporting record ad bookings for the first nine months of this financial year, with the total up 3.1 per cent to a record level of $5.44 billion.